Thank you for all of the love & support over the past few months. It is with great pleasure that I bring this stitchy site back to life. The greatest thing that has happened in my 20’s is the birth of my goddaughter Lumyhna. Her Mama, Bethany, is one of my oldest friends. Thanks to the summer shuffle, the three of us now share a home and before my world turned topsy-turvy, I finished this birth chart for Lulu. 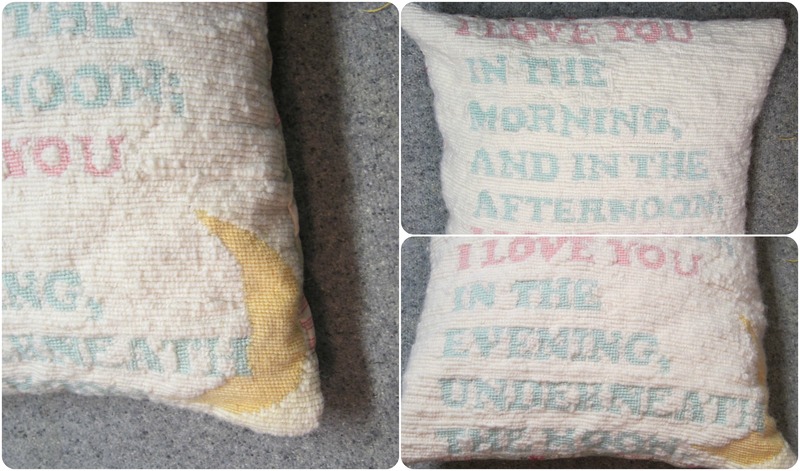 I designed the pattern myself, in MacStitch, and utilized vintage books that are legally shared online. Beth has an ethereal love of mystical creatures, which I am sure she will pass onto her daughter. So, I included blackwork-style pegai, fairies and dragons to break up the information. 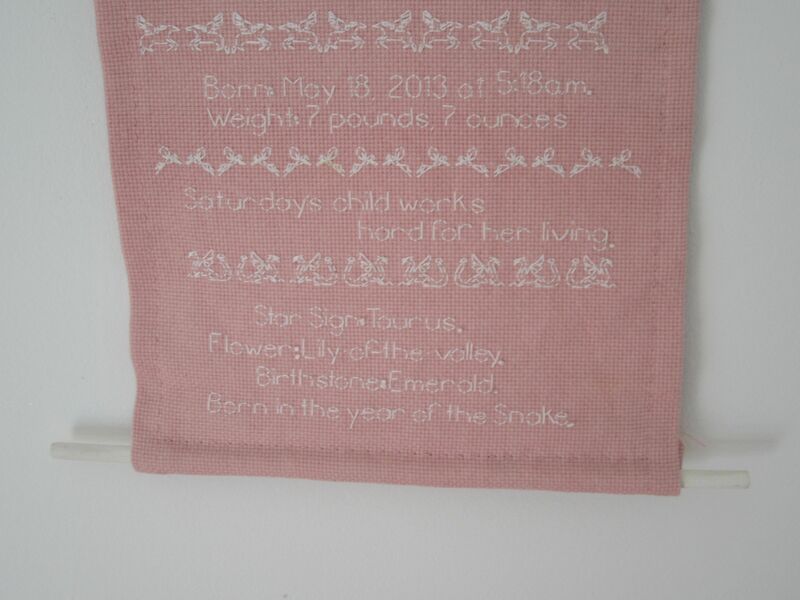 I’ve always had a thing for horoscopes as well as the rhymes and trinkets associated with one’s birthday. This way Lulu will have all of her information in one pretty place as she gets older. For this project I used 14 count Aida fabric and DMC floss from my stash. 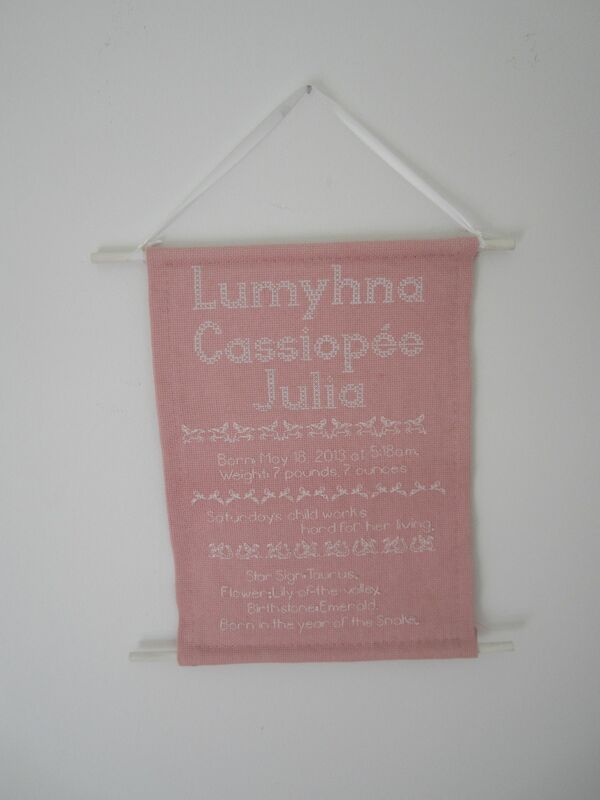 The colour of the thread varies slightly after Lumyhna’s name – I don’t know if you can tell in the pictures – this is because I am using up all my “unknown” threads before I buy more. This piece is the first that I’ve finished as a scroll (or “bellpull”), and I truly love how it turned out! I followed this tutorial by reddit user /u/geekitty and fully recommend you do the same. I purchased the dowel at the hardware store for $.99, and painted it white to match the stitches. Protip: Hold onto the dowel using clothespins while painting, this keeps them from rolling away and allows the paint to dry evenly. If you’re interested in commissioning a birth chart for your own baby or a friend’s, shoot me an email and I’ll get back to you ASAP. My rate per birth chart is $75 CAD (plus shipping, but if you live in Toronto I’ll hand deliver it for free. Ha.) and they take 4 – 6 weeks to complete. What do you think of this baby birth chart? 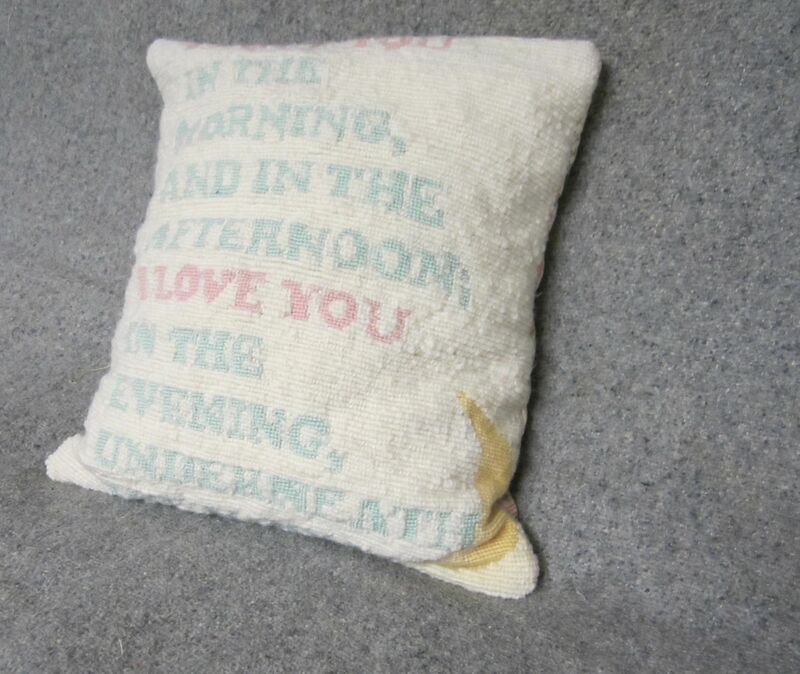 Have you made a sampler for a little loved one? I’ve been waiting ages to share this creation. I’m glad it has finally been delivered and this post can go to air! When I found out that my friend Sarah was pregnant with Elizabeth, I wanted to make her a present that was sentimental, but also used up a bit of my stash. After poking around the internet for ideas, I decided to make her a needlepoint pillow for her nursery. 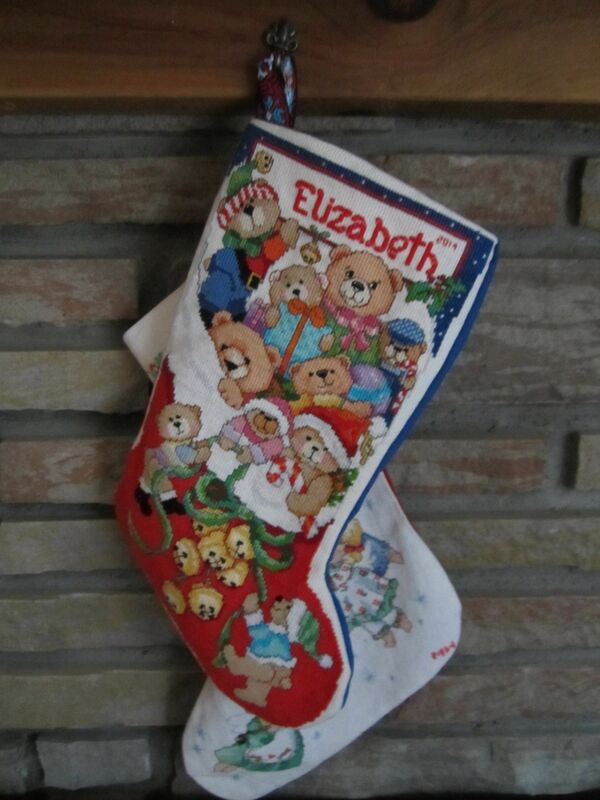 While Sarah’s baby shower happened in October, I had to take a break from this project to focus all of my creative energy on Elizabeth’s stocking. In January, I finally finished the whole canvas and sewed it up. This project was quite a learning experience. Although I’ve made one needlepoint pillow before, this canvas was much larger to work on. I began by printing out the lyrics of a popular children’s song and tracing them, using a Sharpie, onto the needlepoint canvas. Then I used colourful yarn, also used for my flowered headband, to fill in the letters and the crescent moon, because this baby yarn is so thin, I had to use to strands per stitch (2 ply) in order to insure the proper coverage. The background yarn was much chunkier, so, I only used one strand per stitch. This led to a very interesting texture difference of the pillow. After the canvas was fully stitched, I sewed it up using a simple envelope method. The backing fabric is also from my stash, I have no idea where it came from – I’ve been using a large portion of it as a tablecloth for years! It’s so pretty though, I knew it needed to find a better home. 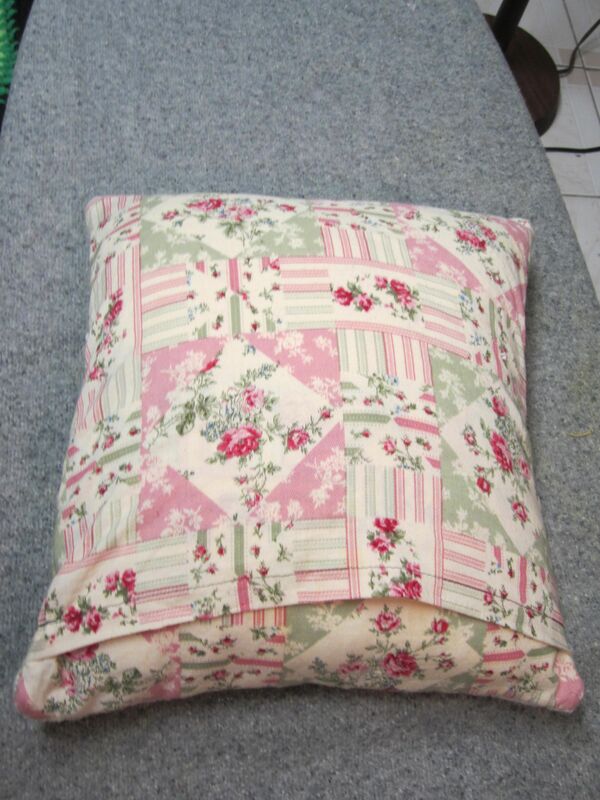 I’m also pretty impressed with myself, because the pillow form I used to stuff this cushion, I made out of recycled scraps of fabric. Sarah was quite pleased with the pillow, and I’m happy her and Elizabeth will be able to enjoy it. However, I do feel this project was a learning experience! Most importantly I’ve realized that pale colours on a cream background do not provide a strong platform for text-based pieces. There needs to be a defining line in order to make the message more readable, and allow the stitches to pop. As well, with my needlepoint, I feel the need to explore a variety of background stitches. Mostly because stitching thousands of tent stitches takes an amazing amount of time, but also so that different textures can be a highlight of the project. How about you? Have you made any projects lately to use up your stash? 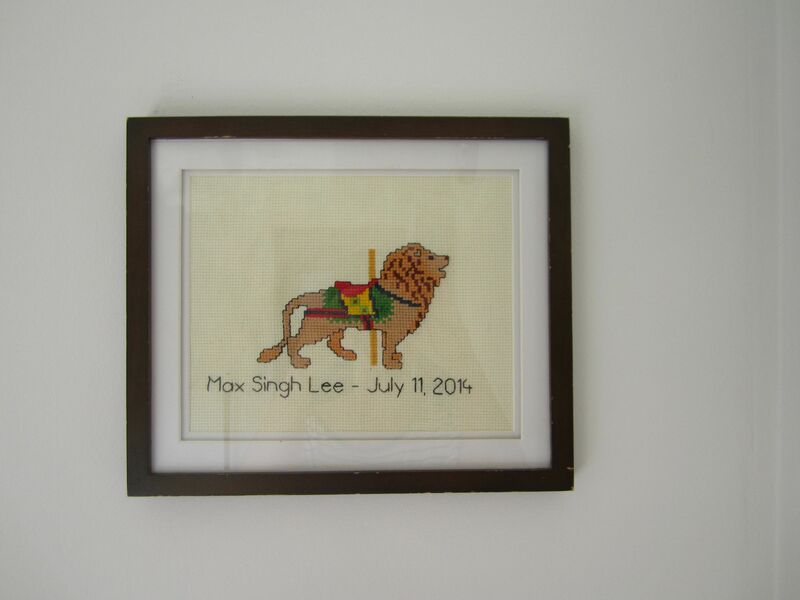 Any needlepoint pillows which you’d like to share? 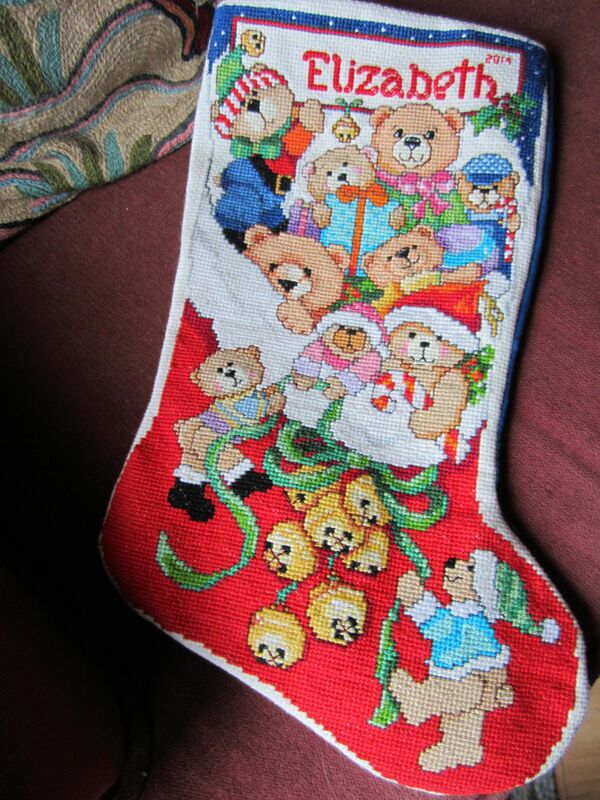 In the fashion of a modern Christmas miracle, I finished my biggest project of the year – the Christmas stocking – with several days to spare. While I am not an overly experienced seamstress, I found the construction of the physical stocking to be doable with a fair bit of stitch ripping, and multiple deep breath sessions. One of the best tricks that I figured out was when it came to developing the pattern for the back of the stocking. Instead of photocopying the template from the book and blowing it up (Which involves using photocopiers as if it were 1995? ), I placed a piece of parchment paper over the embroidered work and created an outline, then I used the outline as a pattern. The stocking is also fully lined, and I even made a label! 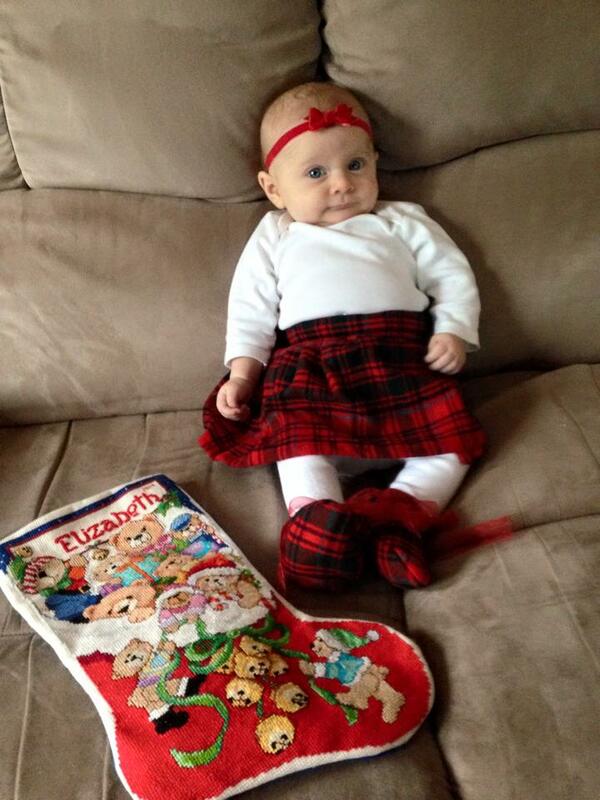 This is Elizabeth in her 1st Christmas outfit, with her Christmas stocking. This picture was taken by Sarah Newhouse and used with permission. If you’re interested in commissioning a holiday stocking for next year, please use the Contact page – I’d be more than interested!